Birds by Toikka Indigo Bunting - 9.5" x 4.25"
Birds by Toikka Grey Dove, FinnFest 2018 - 7.5" x 4.75"
Birds by Toikka Red Cardinal - 8" x 5.5"
Birds by Toikka Yellow Rumped Warbler - 6" x 3.5"
Kay Bojesen Denmark "An object must have soul, function and be nice to have & hold." Hans J. Wegner Denmark "The good chair is a task one is never completely done with"
Poul Henningsen Denmark "Art is the ability to separate the significant from the insignificant." Louise Campbell Denmark "There must be a good reason for every single design decision"
Arne Jacobsen Denmark "I have no philosophy, my favourite thing is sitting in the studio." Verner Panton Denmark "A failed experiment can be more important than a trivial design." FJ�RN Scandinavian began more than twelve years ago as a family-run store where we could share our focus and passion for modern Scandinavian design. Our goal has always been to source and bring to our customers the best in Scandinavian home furnishings and luxuries — whether its the 100 year Danish classics that we treasure or the new that we discover on our Scandinavian buying trips. FJ�RN stocks and delivers beautiful and cherished things for the home that families throughout Norway, Sweden, Denmark and Finland know and love. Since our online start-up days, we�ve expanded our customer-focused approach with a bricks-and-mortar studio in California. Whether you purchase over the internet or visit our location at the the Pine Inn Hotel overlooking Carmel Bay, you�ll receive the same dedicated, personalized and caring service. 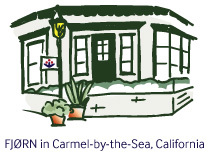 Shop online, by phone, or come in and browse and say hi to the FJ�RN family on Ocean Avenue in Carmel-by-the-Sea. Read more about us and our story.